The 2018 WTKO Canada Invitational Fall Seminar is fast approaching and now would be the best time to register. Send a email to Sensei Steve Burch or Sensei Phil Harris for more info on payment or any questions you may have regarding the classes! Kildonan Karate is proud to once again host Sensei Scott Middleton, 6th Dan, International Director for WTKO. This is a “one night only” event for all brown and black belt Shotokan Karate practitioners. Everyone is welcome, regardless of affiliation! DATE Friday, June 22nd, 2018 6:30pm to 8:00pm – Brown and Black Belt class 8:00pm to 9:00pm – … Continue reading "Evening Seminar with Sensei Scott Middleton, 6th Dan – Friday June 22nd, 2018"
Hello everyone, This message applies to Kildonan Karate students (other than Tiny Tigers). 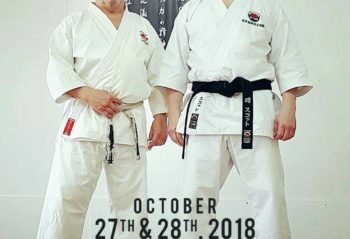 TESTING We offer testing approximately every 3 months, our next testing date has been set as follows: Monday April 9 There will be a warm-up class from 6:00 p.m. to 6:45 p.m. with testing beginning at 7:00 p.m. All students can attend … Continue reading "Kyu Testing on April 9th, 2018"